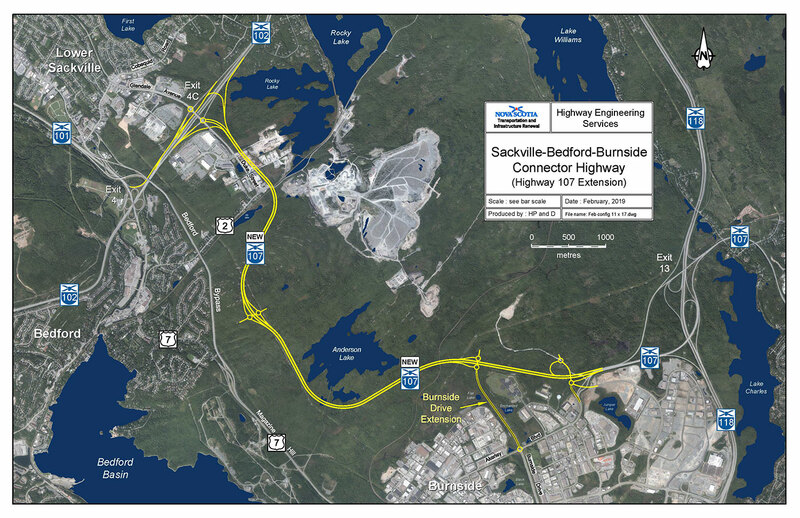 The Department of Transportation and Infrastructure Renewal (TIR) is proceeding with the construction of an extension to Highway 107 that will connect Burnside to the communities of Bedford and Sackville. Planning and design work are underway in preparation for clearing scheduled for spring 2019. Magazine Hill and the Bedford Bypass are the only direct links between Burnside and the Bedford and Sackville areas. Over 40,000 vehicles use these roads every day and the associated traffic congestion causes queues that exceed several kilometres. This section of Highway 107 has been a long-standing gap in the 100 Series network that will improve safety and travel times for commuter and commercial traffic. This project will have a net positive effect on the overall highway network in the area because traffic will be diverted from many roads in Halifax, Bedford, Sackville, and Dartmouth. The proposed highway will be a 9 km controlled access 4-lane freeway with a 1.2 km arterial connector (extension of Burnside Drive). Starting near the interchange with Highway 118, the highway will travel west toward Bedford, south of Anderson Lake and then connect with Highway 102 near Exit 4C. A map has been provided that illustrates the location of the new highway. There are three interchanges planned for the project: the eastern most interchange is a split diamond that connects to Burnside Drive, Akerley Boulevard, and future Burnside expansions; the interchange near Anderson Lake is a full-diamond with roundabouts intended to provide land access and potential future connectivity with the Bedford area; and the western interchange, which will provide direct connections with Highway 102, it will also tie into a roundabout at Highway 102 Exit 4C for vehicles travelling to and from Lower Sackville. The project will also require a number of structures needed to cross over railways, utilities, and local roads. An environmental assessment was completed and registered with NS Environment in July 2017. The Minister of Environment requested additional information in August 2017 for baseline fish, fish habitat, and mitigative measures for project-related impacts. TIR submitted the additional information in June 2018 and project approval was received from the Minister of Environment on August 7, 2018, subject to Terms and Conditions. The total estimated cost to construct the highway, interchanges, and connector road is $210 million. Highway 107 is a key component of the 100 Series Highway System within the HRM and this project has been approved for Federal funding contribution of up to $86.5 million. Planning and detailed design work is underway for this project. Construction of this project requires completion of the detailed design for the highway, structures, and interchanges, along with the acquisition of land, environmental mitigation plans, and unexploded ordinance mitigation. TIR is proceeding on a schedule that will result in clearing of trees and vegetation at the eastern (Burnside) end of the project in spring 2019. All construction for the project is scheduled to be completed in Fall 2023.